4 bedrooms, 3 bathrooms with countryside views yet only 3 miles from the beach! Rocksalt is our lovely 4-bedroomed holiday home just outside Rock on the North Cornwall coast. Built and furnished to a very high standard in 2008, the house is situated in a glorious setting with far-reaching views over the Cornish countryside, yet is only a few minutes drive from Rock which offers water skiing and paddle boarding, the surfing beach of Polzeath and child-friendly Daymer Bay beach. The accommodation is light and airy and comprises 4 large bedrooms with 2 en-suites and 1 family bathroom; an open-plan luxury kitchen/lounge/dining area which is very well-equipped with large comfy sofas, a flat-screen HD TV and all mod cons. There is a south-facing garden (which is fully secure as it is fenced at the front and back) with a weber charcoal bbq and an outside hot and cold surfers' shower. NEWSFLASH: WE NOW HAVE SUPERFAST UNLIMITED BROADAND. You can watch BBC iplayer,YouTube etc on the TV and Netflix if you have an account. Not only is the house well-served for numerous beautiful beaches but nearby there are four excellent golf courses as well as an enormous range of other activities including surfing, water-skiing, coasteering, kayaking, cycling, sailing and tennis. Days out include the quaint fishing village of Port Isaac (location for the TV series Doc Martin); Padstow with its shopping and superb restaurants including Rick Stein's famous 'Seafood Restaurant' (the water ferry runs constantly from Rock to Padstow during the day); the scenic Camel cycle trail from Bodmin to Padstow via Wadebridge (ideal for all ages and easy to organise cycle hire) and slightly further afield, the world renowned Eden Project. This is a perfect location for families, surfers, golfers, foodies and walkers. Upstairs there is one large double room with super king-size (6 foot) bed, one large twin-bedded room and one family bathroom with shower over the bath. Downstairs there is one double room with king-size (5 foot) bed with en-suite bathroom with shower over the bath and one twin-bedded room with en-suite shower room. White bed linen and towels are all provided for your convenience. This is the perfect house for one large or two small families. There is a large, sunny, south-facing patio with bbq and table with bench seats. To the side of the house is a private hot and cold surfer's shower. There is also use of a field in front of the house - a wonderful place for children to play. My husband, Simon, and I bought RockSalt in 2008. We both grew up in the west country and co-incidentally spent many holidays as children in and around Rock and Polzeath and wanted our children to grow up with the same happy memories. Hannah and Tom now have the same love of Cornwall as we have and although they have outgrown the bucket and spade days on the beach, they now love surfing, wake-boarding, walking and the fabulous food on offer from pasties in the Rock bakery to Rick Stein's fish and chips in Padstow. 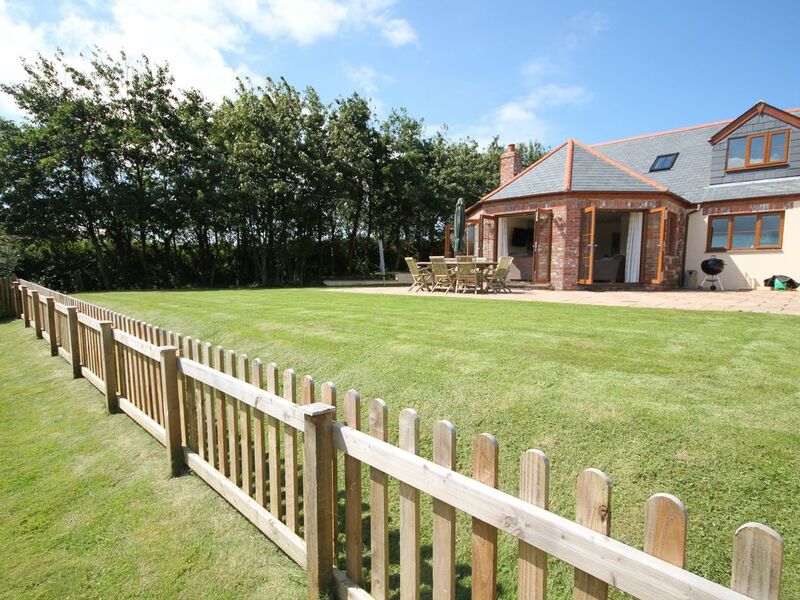 RockSalt enjoys a quiet countryside setting yet is only a short drive from Rock, Polzeath and Daymer Bay. Our home is furnished and equipped to a very high standard - towels are provided and beds are made-up for your arrival so that you can begin your holiday as soon as you arrive. A completely enclosed garden with BBQ is ideal to sit in during summer evenings and for children to play in. We also have use of a field in front of the house where children can play ball games and you can relax and watch them from the lounge or garden. In addition, there is an outdoor shower where you can wash off after a fun-filled day at the beach. RockSalt is our home and we look forward to sharing it with you. There is one family bathroom upstairs with toilet, sink and bath with shower over. Downstairs there are 2 en-suites, one with a toilet, sink and bath with shower over (double bedroom) and the other with a toilet, sink and shower enclosure (twin bedroom). WE NOW HAVE SUPERFAST UNLIMITED BROADAND. You can watch BBC iplayer,YouTube etc on the TV and Netflix if you have an account. You can watch BBC iplayer,YouTube etc on the TV and Netflix if you have an account. Fully enclosed garden which is very safe for children. Gate access to a field in front of the house where children can play whilst you can see them from the lounge and garden. There is a separate utility room housing the washing machine and tumble dryer and a drying rack. Outside, there is an enclosed garden with a sunny patio, table with bench seats and a BBQ. There is also easy access from the garden to a field where children can play ball games in full view of the lounge and garden. To the side of the house there is a hot and cold surfer's shower to use when coming in form the beach to wash wetsuits etc. Cleaning / Towels / Linen / Maid service: The linen and bath towels are provided and included in the price. The property is cleaned and beds made up before arrival. Cleaning during your stay can be arranged at an extra cost. WE NOW HAVE SUPERFAST UNLIMITED BROADAND. You can watch BBC iplayer,YouTube etc on the TV and Netflix if you have an account. We had the best time at SaltRock. The house was perfect for 2 families with plenty of space. We enjoyed a BBQ and the garden on our first night and used the well equipped kitchen the next evening. The house itself felt luxurious and is finished to a high standard. Rock is only a short drive and from there you can get a boat to Padstow which is lovely. We very much hope to stay at SaltRock again soon. Thank you for your lovely review of RockSalt. I hope we can welcome you back again soon. Lovey stay over New Year, warm and comfortable, lots of space for 3 couples! We loved the space, very comfortable for 3 couples! Everything worked well. I’m so pleased you enjoyed New Year at RockSalt Chris and found it comfortable with everything you needed. I hope we can welcome you back one day. Rock salt was an amazing home to stay in for our family Christmas break . It was everything we wanted. A fantastic layout for us all to be together. As we were cooking on Christmas Day , everything was available to use and a turkey dish was left for us , which was so useful. The house was very clean and modern. We were given good information prior to our stay and the owner was always available for questions and very helpful. I would definitely recommend Rock salt. Thank you so much Karyn for your lovely review of RockSalt. I’m so pleased you had such a great Christmas there. We look forward to welcoming you back again soon. This is a lovely house, with country views at the back, and large doors to make the most of the countryside views. Ros' villa is very well equipped with large comfortable sofas for relaxing in the evenings. The house is very convenient for all local attractions, with some beautiful walks on the nearby glorious beaches, and Padstow is only 20 minutes away. Thank you Alan for taking the time to review RockSalt. I’m so pleased that you enjoyed your stay and we are looking forward to welcoming you back next October. Thank you so much Jo for your very positive review. I am so pleased that you had such a lovely holiday and look forward to welcoming you and your family back to RockSalt very soon. The property really is fabulous ! Thank you Pam for your lovely review of RockSalt. I’m so pleased you enjoyed your stay so much.